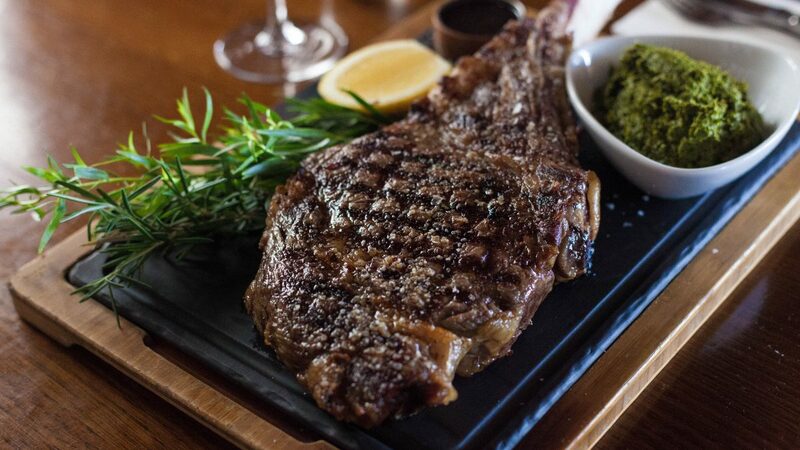 This steak is a real head turner. This recipe allows the steak to be the star. I serve it with chimichurri, a South American version of pesto, which I’m obsessed with at the moment. Chimichurri is loaded with herbs and has a zesty, zingy flavour. I love placing a spoonful of chimichurri on a freshly grilled steak, and hearing the sizzle as the aroma and flavours are released. Roughly pull apart herbs, keeping the stems to add flavour. Blend all ingredients together, and add salt and pepper for seasoning. Put to the side. Leave the steak at room temperature for at least an hour before cooking. Preheat BBQ until very hot. Place the steak onto the char grill and cook on one side for about 15 minutes, controlling the heat to develop a nice crust on the meat. 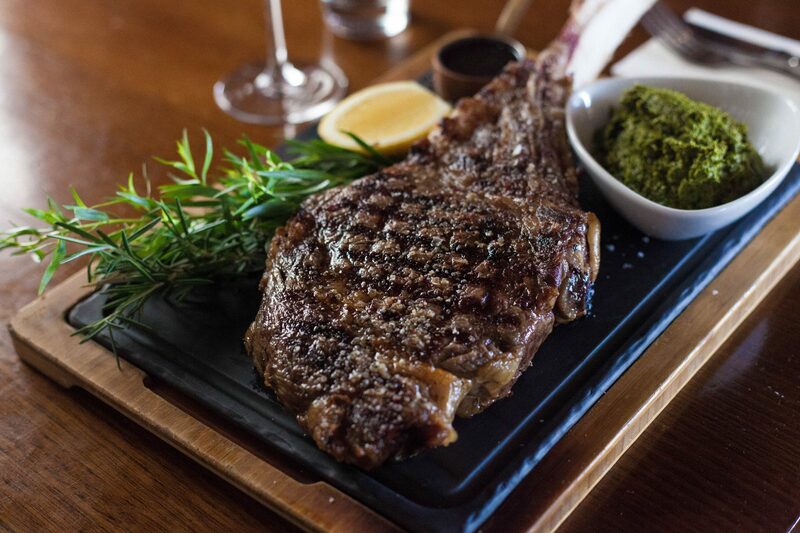 Rotate the steak at a 90 degree angle to get the classic criss-cross pattern – this will be your presentation side. Turn the steak over to seal the other side, cooking for only about 5 minutes. Remove the steak from the heat and rest it on a warm plate for at least 15 minutes. While the steak is resting, cook the peppers on the char grill until the skins are blackened. Remove the peppers, place them in a bowl and cover with cling wrap to let them sweat. This will allow the skin to peel off easily. Peel the skins from the peppers – you can run them under water to help with this – and pat dry with kitchen towel. Place to the side. Return the steak to the hot grill again to finish cooking. Cook to desired doneness. For a medium rare steak, the time will take approximately an additional 10 to 15 minutes. Serve whole with the extended bone, chimichurri, a side of roasted peppers and slice of fresh lemon.